In July 2015 Steelcad Drafting began modelling steelwork for No.1 William Street Project. Anyone travelling up and down the riverside expressway over the past year would have seen the building rising out of the ground. 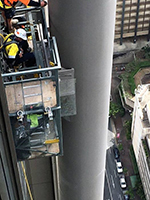 1 William Street is now a completed skyscraper in Brisbane, and is the tallest in the city at 267 metres. The modern style office building is located in the Brisbane central business district in close proximity to Parliament House. 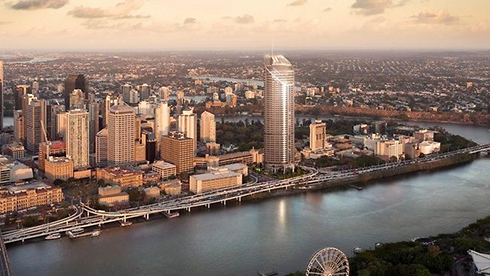 The building was developed for the Queensland Government as part of the government's plan for a renewed Government Administrative Precinct and to meet its accommodation demands. Construction cost of the tower is expected to be $538 million, with a total development cost of over $650 million. It is to be completed in late 2016. The project had many challenges to face for the Detailing team and weekly meetings were par for the course in being part of a solution to resolve design issues. 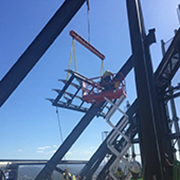 Primary Structural Steel Fabricator and Construction Contractors: Hosken Site Steel Pty Ltd. Integrated Construction Modellers and Steel Detailers: Steelcad Drafting Pty Ltd.
Steel Erection Subcontractors: Mulherin Cranes and Rigging Pty. Steelcad’s scope was the Crown (Primarily the 6 levels of sloping roof structure) and the spire. 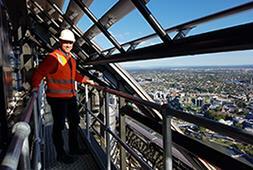 The Crown is about 690 tonnes of structural steel and the spire which is 90 meters from top to tail is about 75 tonnes. Steelcad were contracted to Hosken Site Steel and embedded with the Design Consultants on an ‘Early Engagement’ basis. 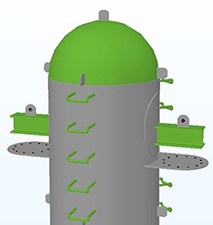 This was primarily due to the status of the design at the time of their engagement and that Steelcad are experts in this complex workspace. 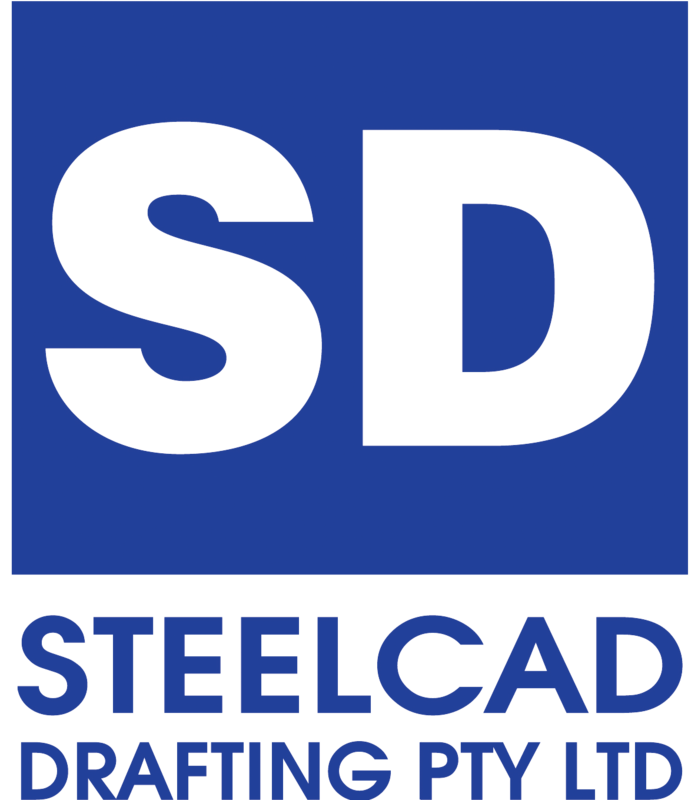 Steelcad became an integral member of the design team and assisted significantly in the design development and completion of all areas of the steel structure. Pre-assembled modules accelerated erection times. 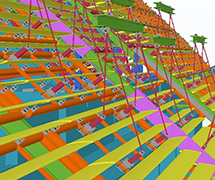 Steelcad also added their experience and value in terms of Project Engineering support, offering their services to complex lifts studies, temporary works design, numerous As-Constructed Survey Interfaces and virtual construability simulations. 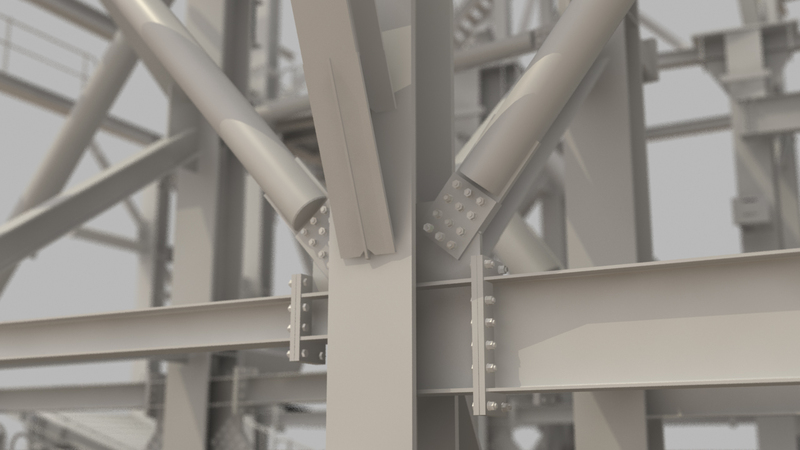 Steelcad's engineering support during the construction phase was a fundamental factor in progressing the day to day site works with confidence. Secondary roof framing lifting arms, kept the frames at 46.1 degrees so they dropped into the support connections easily. The Structural Steel for the Crown Roof and Spire was actually constructed twice. The 1st time was in the virtual sense, with the Integrated Construction Model facilitating the virtual construction simulations and the 2nd time in reality on site. 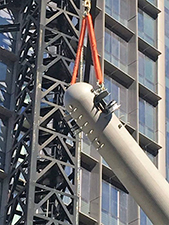 Steelcad were also involved in working closely with the riggers – Mulherin Rigging, and were part of many of the lifting solutions for the steelwork for the crown and spire. 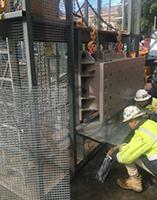 The “Shark Cage” being fitted to one of the spire stubs. 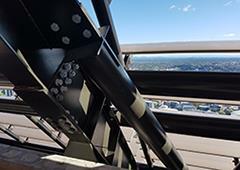 The riggers stood in this cage off the side of the building and enabled them to tension up the 30-M36 HD bolts and the 30-M36 bolts to spire. The spire was surveyed 8 times in order to pick up fabrication discrepancy and also capture any building construction discrepancy. 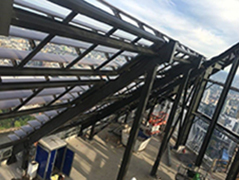 These surveys were conducted as steelwork was erected and then the results compared back to Steelcad’s ICM to determine any changes required in fabrication to ensure fit up of following sections of steelwork. This process became invaluable as any misalignment would have meant abortion of a lift which would have been a time consuming and costly exercise. No erection sequences of the spire were aborted at, all as a result of the surveying, meetings with the rigger and fabricator and modifications made to steelwork to suit as built information. Steelcad team leader, Aaron Raaymaakers.